Vintage garage paperwork from 1928. Homepage. This page: An item of paperwork issued by a motor engineering emporium situated in Folkestone, 1920s. Vintage garage in Folkestone, Kent. I buy interesting letterheads and invoices that relate to vintage cars, garages and motor suppliers whenever they turn up, especially if they incorporate an interesting design or illustration. This interesting little item relates to Martin Winser Limited, Motor Engineers & Coachbuilders, of Folkestone in Kent. The illustration shows a proper 1920's-era garage, which must have looked a treat. Two addresses are given, one on Christchurch Road, the other on Bouverie Road West. In addition to garage services, they could also supply their customer with a hire car, or if they preferred, a brand new Armstrong or Singer motor-car. They claim that they were sole agents, but for which - Armstrong or Singer? Singers were one of the best-selling cars of the 1920s so they couldn't have been sole agent for Singer cars, unless they meant in that immediate area only? 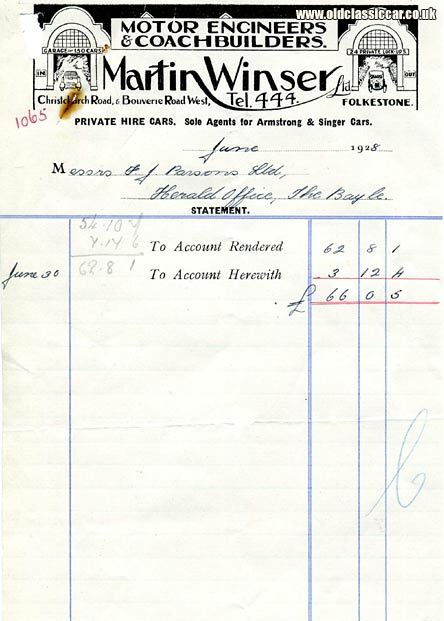 The handwritten note is a statement of account for one of their customers, namely F.J. Parsons Ltd, Herald Office, The Bayle, dating to June 1928. F.J. Parsons Ltd was a publishing company. The garage illustration over to the left features a sign proclaiming that parking for 150 cars was available, while to the right the option of hiring one of 24 private lock-ups was offered. I wonder what became of this company's garage buildings? I found reference to a modern tyre depot located on Bouverie Road West, and a garage operating on Christchurch Road, so perhaps the original M. Winser buildings were demolished and replaced with later replacements. The RAC handbook for 1928 advises that Martin Winser Ltd's garage on Christchurch Road was called Clifton Garage, although there is no reference to a garage on Bouverie Road West which seems strange, unless perhaps this was his home address? A post-war RAC handbook (1949-1950) also refers to the company being at Clifton Garage only. More items of motoring ephemera, including a varied collection of garage-related items similar to the one above, can be found in the Motoring Collectables section.